Anne Fisher leads a remedial math study session at Tulsa Community College as students prepare for a final exam last December. 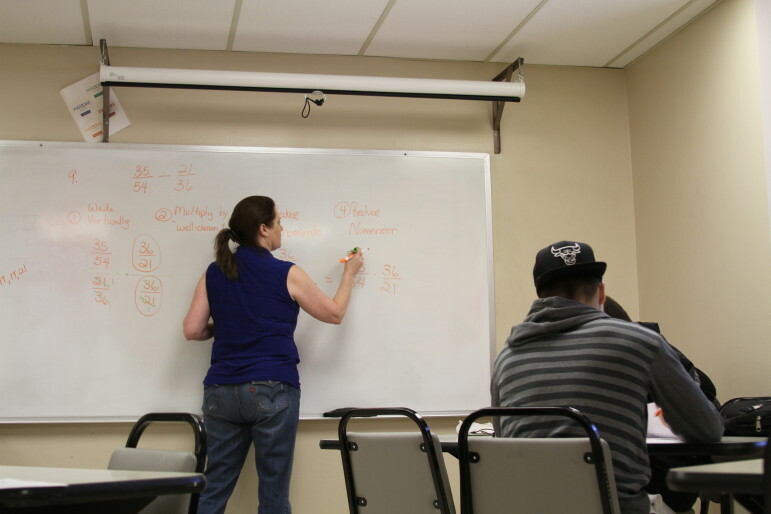 TCC is among several universities and colleges in Oklahoma revamping remedial courses in math and English in order to improve student completion rates. The warning directed at nine Tulsa Community College students last fall, heading into finals week, couldn’t have been clearer: Be ready for fractions – lots of fractions. Numerators, denominators, decimal conversions – these were among the math expressions that students in professor Anne Fischer’s class should have learned in high school but didn’t. If they don’t master them, they won’t be able to earn an associate’s degree or pursue their major at a four-year college. Fischer said those students are like thousands of others in Oklahoma. They come to community college with learning gaps, often in math or writing, and continue to struggle. “Not all of them will make it through,” Fischer said. To be exact, only 17 percent of all students, full-time or part-time, who enrolled in Oklahoma community colleges in 2007 earned a bachelor’s degree within six years, according to the Community College Research Center at Columbia University. 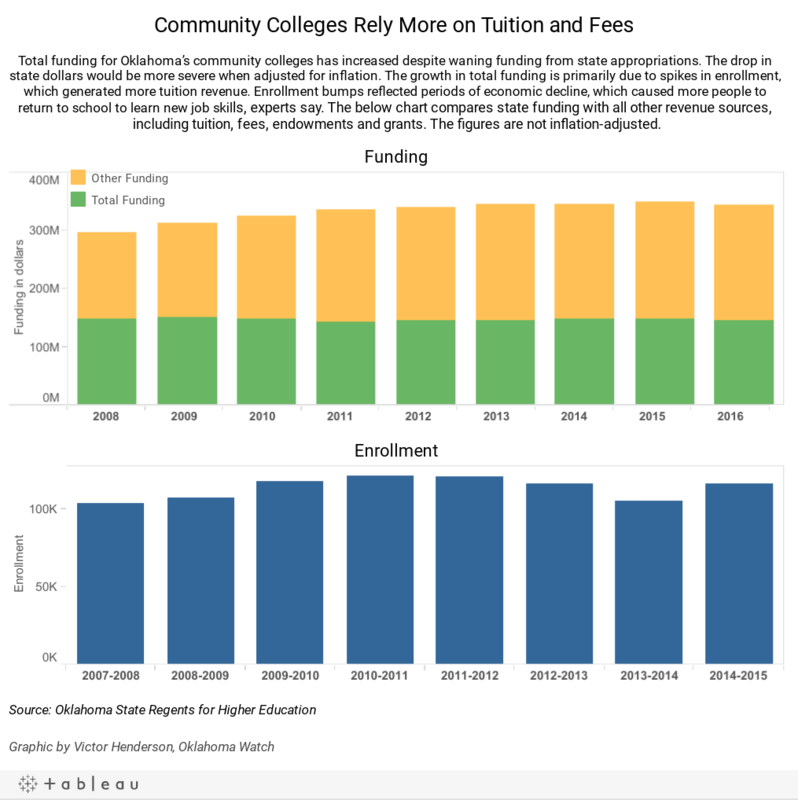 In Oklahoma and nationwide, community college essentially is a dead end for most students who enroll wanting to propel themselves to a bachelor’s degree and the benefits it can bring. Getting students on a pathway to a bachelor’s at a four-year institution is one of the primary missions of community colleges, education experts say. Research shows that nationally, about 80 percent of students in community college enroll with that intention. Most need remediation. Oklahoma’s success rate of 17 percent is actually higher than the nation’s, at 14 percent. By contrast, the six-year graduation rates for the University of Oklahoma and Oklahoma State University are around 70 percent when accounting for transfer students. Margaret Lee, dean of developmental education at Tulsa Community College, said it’s up to community colleges to keep students enrolled and progressing toward a degree despite the personal challenges those students may face. Many come from high-poverty neighborhoods. Gary Davidson, executive director of the Oklahoma Association of Community Colleges, said while there is room for community colleges to improve, the state needs to provide more funding to make that happen. “While I think we have done an incredible job, you can’t expect us to keep improving with the resources available to us,” Davidson said. Total funding for community colleges has climbed for most of the past decade, driven in large part by tuition and fees paid by growing numbers of students. A total of $343 million was budgeted this fiscal year but has dropped because of budget cuts. That number encompasses all revenue sources, the largest being tuition, fees and state appropriations. The enrollment gains were spurred by the Great Recession, which caused more people to return to school to improve their job skills, education officials said. Those numbers fell in recent years but spiked again in fiscal 2015, reflecting the oil and gas downturn. State appropriations for the colleges have been relatively flat for a decade and, when adjusted for inflation, have declined. This year, the budgeted state share of total funding was 42 percent, or $145 million, the lowest amount since 2012. Education officials attribute the low persistence rates to various factors. Davidson pointed to a lack of college readiness among high school graduates as the biggest challenge. Unlike selective four-year institutions, community colleges consider it part of their mission to admit almost everyone who applies. That translates into a student population with relatively weak academic skills. Higher education officials also blame low completion rates on what they say are community colleges’ ineffective ways of working with students. Several officials from community and four-year colleges said remedial courses designed to help students catch up instead have caused many to drop out. Historically, for students needing multiple remedial courses, colleges and universities offered the classes in a three-semester sequential format. That meant a student unprepared for college-level algebra would have to take up to three semesters of remedial math before taking college-level courses. If they failed a remedial course, they would have to take it again. Students became frustrated and didn’t want to keep paying for developmental classes. Research shows the longer students spend in remedial classes, the less likely they are to graduate with any degree. Dropout rates at colleges vary widely. At Tulsa Community College, 75 percent of all freshmen enrolled in 2009 did not earn an associate’s degree, a certificate or a bachelor’s degree at any college within six years, according to the national Student Achievement Measure. Only 15 percent received an associate’s degree or a certificate. At Rose State, 33 percent of students dropped out and 23 percent earned an associate’s; 39 percent transferred to another school, but it’s not known how many transfer students earned a degree within six years. The state’s low rate of adults with bachelor’s degrees – 24 percent of those aged 25 or older – suggest many transfer students don’t earn the degree. Davis Jenkins, a senior research associate at the Community College Research Center, said the failure to prepare students to transfer from a two-year to a four-year college has societal ramifications. “If we care about access to low-income students and students of color, then we’ve got to worry about this transfer thing,” Jenkins said. Tulsa Community College student Eve Nixon. More community colleges and universities are adopting new strategies to keep students enrolled and on track toward a bachelor’s degree. Research shows students who get up to speed academically and graduate from community college are just as or more likely to graduate from a four-year program as incoming freshmen. The new approaches focus on shortening the time spent in remediation, by offering remedial classes on an accelerated schedule or offering them concurrently with ones required for a degree. Eve Nixon, a freshman at Tulsa Community College, completed two remedial math courses in one semester under a program begun several years ago. Nixon, 27, dropped out of high school in 2007 and went to work for her father’s construction business. She also had a son. After her father died, and she got sick, Nixon said she had to quit. She got her GED and enrolled at TCC last year. She took a placement exam and was told she needed two remedial math classes. She passed those on an accelerated schedule and then took college-level algebra and trigonometry. Nixon said her goal is to get her associate’s degree in chemical engineering and transfer to the University of Tulsa or Oklahoma State University. She wants a bachelor’s degree to improve life for herself and her 7-year-old son. “I figured going back to school was better than working my fingers to the bone,” Nixon said. TCC also plans to offer what the University of Central Oklahoma is already doing – pairing remedial courses with credit-bearing ones. Ideally, the two courses are taken back to back on the same day, said Matthew Hollrah, chairman of UCO’s English department. During the first year of implementation in 2014, 75 percent of students passed their developmental course on their first try; 60 percent passed their credit-bearing course. “That’s on a single attempt,” Hollrah said, which meant most students avoided having to repeat remedial courses. The desire to get a bachelor’s degree sooner is reflected in the dozens of community college students who transfer to UCO still needing remediation. In fall 2015, about 80 transfer students, or 45 percent, needed remedial math. About 60 of those students came from community colleges – mainly Oklahoma City Community College, Rose State and Oklahoma State University-Oklahoma City. Larger four-year colleges are getting out of remedial programs. The University of Oklahoma and OSU don’t offer or are in the process of dropping remedial education. OU shifted its remedial math programs to Redlands Community College and is shifting remedial English and writing to Redlands as well. The students take the Redlands courses on OU’s campus and still pay Redlands’ tuition rates. “It’s not our mission, so we want to outsource to someone who really deals with developmental coursework,” said Matt Hamilton, OU’s vice president for enrollment and student financial services. A statewide task force comprised of community and four-year colleges is also looking at changing math prerequisites to better align with a student’s major. Currently, most students must take algebra regardless of their intended major, although in many cases statistics may be a better fit. Higher education experts say shifting more students from community college to four-year institutions, even if they don’t earn an associate’s degree, is one of the best tools in the state to break the cycle of poverty. Too many students fail and drop out of community college with a mound of debt and no degree, said Lee, the development education dean at Tulsa Community College. Oklahoma City Community College student Trish Arnold, 44, is on her third attempt at getting through community college. Arnold, who is low-income, said a combination of issues involving her first college and her personal life delayed her pursuit of a degree. She started at OSU-Oklahoma City in 2005 but ended up failing with a 1.0 GPA because of problems at home and missing a class-withdrawal deadline. She enrolled at OCCC in 2011, but dropped out to tend to her daughter, who was 6 years old and having mental health problems. She had a 3.7 GPA at the time. 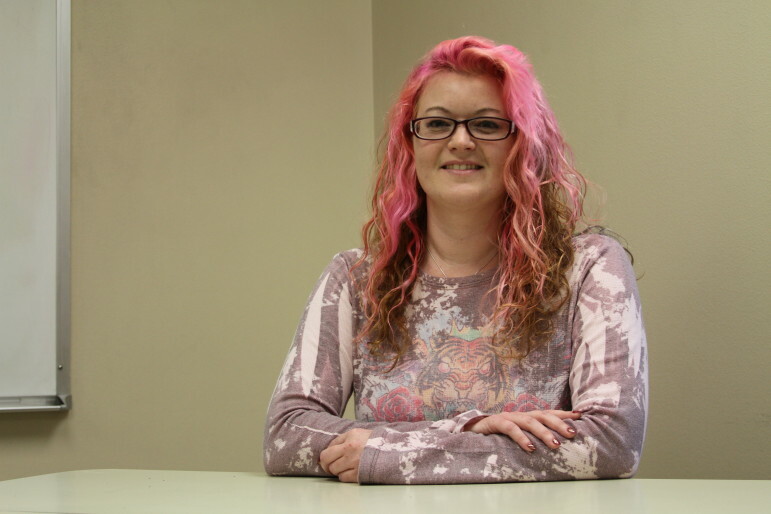 Arnold is back at OCCC, where she hopes to get a degree in substance abuse counseling. She said attendance is key, despite the complications of life. “I have never missed a class, never been late, never failed a class here,” Arnold said.